June 13, 2014 – Chilliwack, B.C. – On Thursday, June 12, Ron and Paul Jarvis arrived in Canada from Atlanta, Georgia and began a three-day father-son fishing trip. 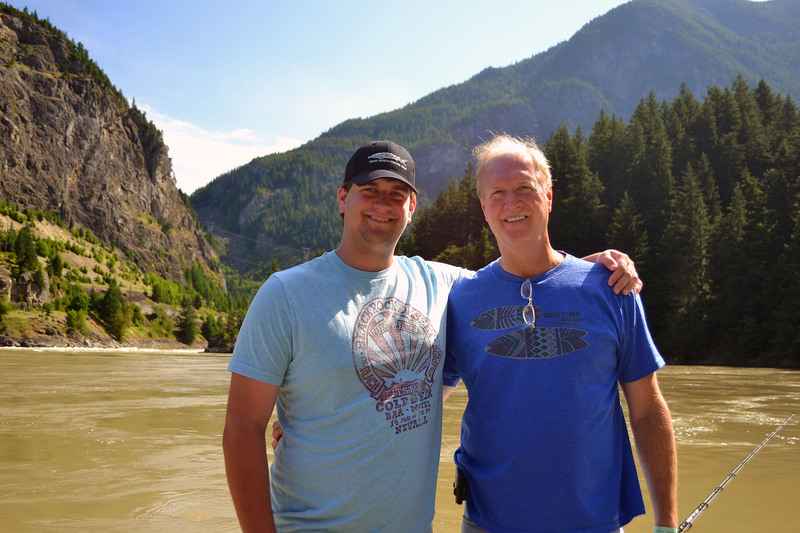 It was the first time 19-year-old Paul Jarvis, an avid angler, had ever fished with his dad Ron. 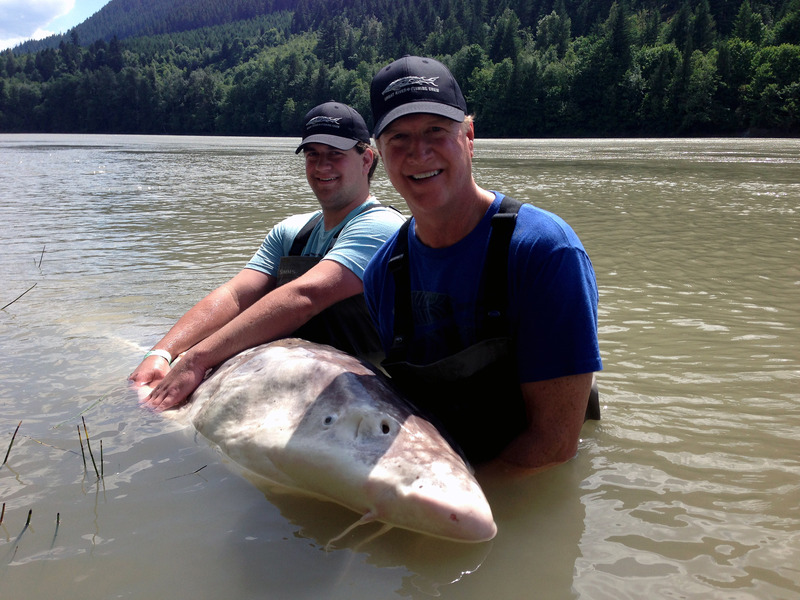 On their first day out fishing, at 11:30 a.m., Paul Jarvis hooked into one of the largest white sturgeon ever caught on the Fraser River. 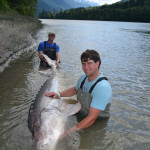 Total length of the sturgeon was 11 feet ten inches (361cm) long (that’s a fork length of 10 feet seven inches (326cm) – nose to V in tail) and 56 inches (145cm) in girth, tape measured below the pectoral fins. Although impossible to weigh fish in the river, based on a mathematic formula used in these cases, the sturgeon caught would weigh over 880 pounds. 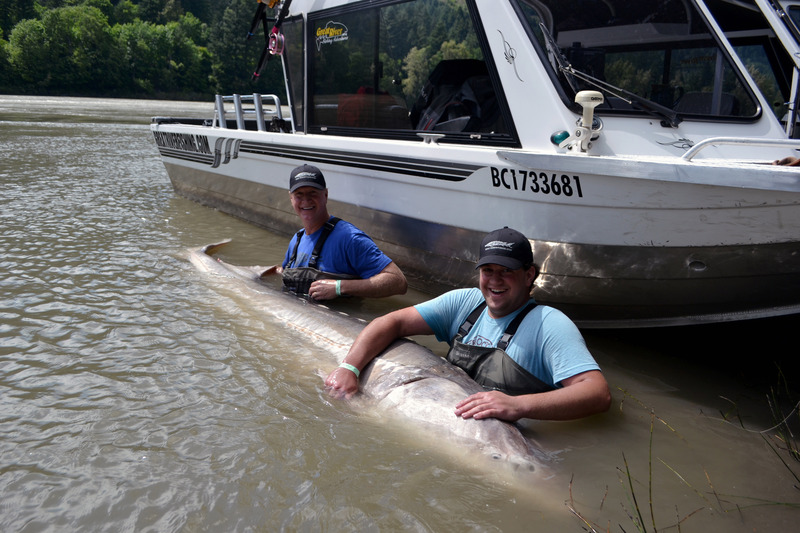 After more than an hour-long battle the sturgeon was brought to shore by the boat’s lead guide Dean Werk of Great River Fishing Adventures. The crew scanned the fish to find it had not been previously tagged. It was dubbed a “virgin sturgeon,” an untagged white sturgeon. Together with Ron and Paul Jarvis, the crew got in the water and measured the fish and applied a PITT tag to the left side below the head of the fish for conservation efforts. 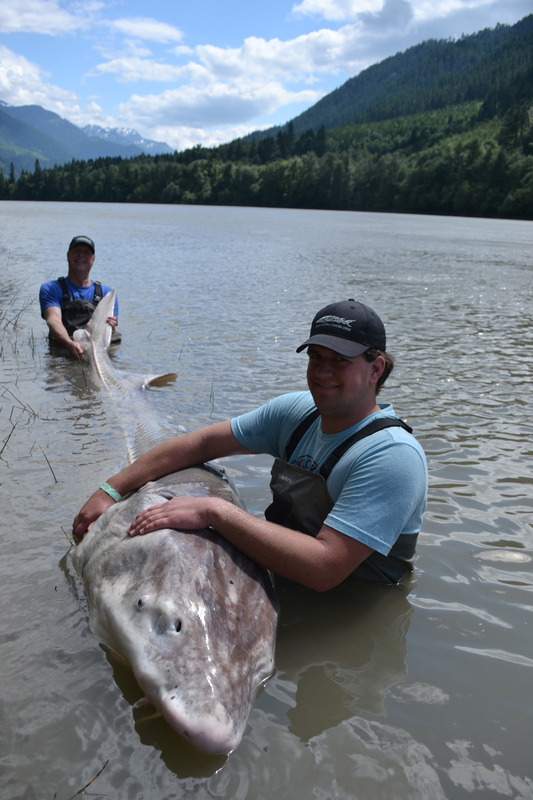 With the sturgeon in the water the anglers got behind it to pose for photos and videos to capture their once-in-a-lifetime catch. 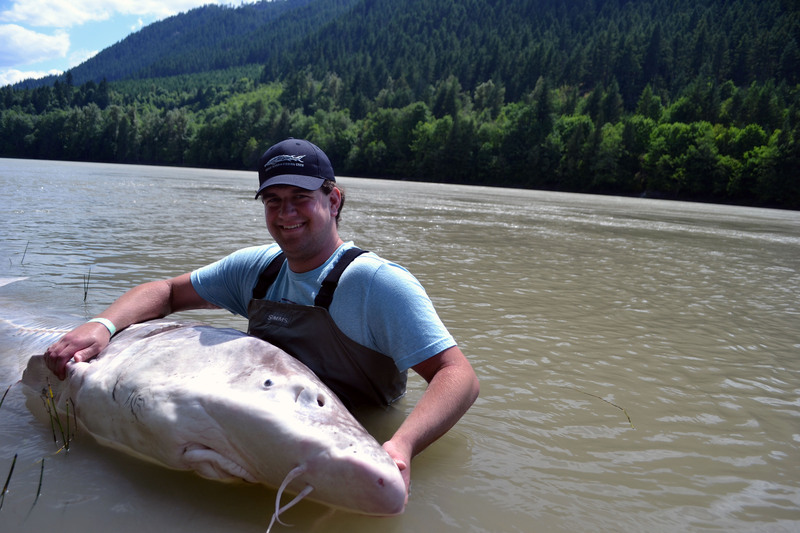 This is the fourth giant sturgeon caught in less than 2 years. 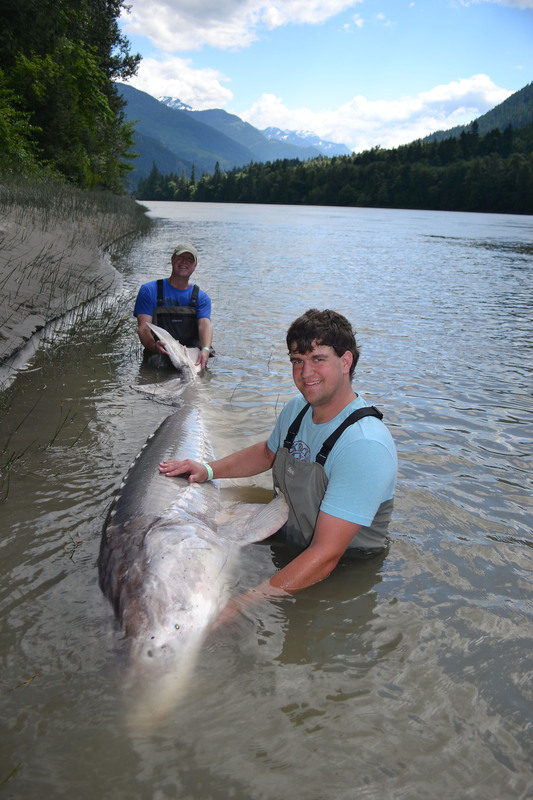 Two years ago on July 2012 when Great River Fishing Adventures made international news headlines when British tourists Michael and Margaret Snell caught a 12ft 4” sturgeon on the Fraser River. 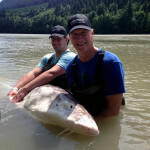 In September of 2012, Norm Daley of Kamloops caught an 11ft 8” sturgeon, when he had a group of 30 anglers from his Kamloops accounting firm out for a teambuilding event. Just last year in September 2013 Neils Rasmussen from Demark, on a trip with his friends, landed himself an 11ft 2”. Since 1988 Great River Fishing Adventures have been chasing sturgeon and providing first class adventures to people from around the world all year round. They have a handpicked team of guides who have over 350 years of combined fishing experience. 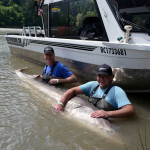 Great River Fishing Adventures provides the opportunity and experience to fish with experts who work hard to also preserve and maintain the Great White Sturgeon and the surrounding habitat. Their passion for preserving these prehistoric fish has been the foundation of their success and motivation for the past 25 years.